London’s “Bourbon-soaked Gypsy Blues Bop’n’Stroll” collective The Urban Voodoo Machine celebrated their tenth anniversary with a vaudeville orchestra extravaganza at Leicester Square Theatre. Before the show, the dozen musicians that make up the Machine line up for their pre-show photocall/fag-break outside the theatre, suited and booted in red and black costumes and pork-pie hats while inside the venue await their glamorous superfans, for whom the red and black dress code is de rigeur. The band makes a theatrical entrance, processing their way through the auditorium and playing themselves onto the stage like a marching New Orleans funeral band. 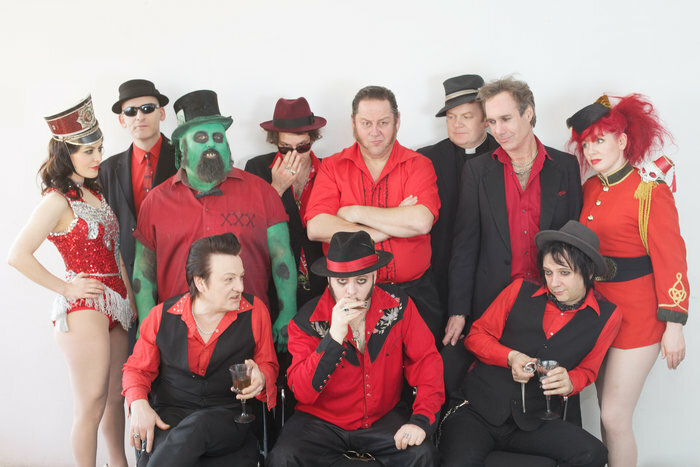 A collective of highly accomplished musicians, The Urban Voodoo Machine create a circus carnival onstage, with a colourful array of instruments including fiddle, guitars, banjo, accordion and mandolin. There’s a mutant drum-kit for two onstage, played in crazy synchronisation by a green-painted lead drummer and his cohort who literally doesn’t miss a beat, even when a snare drum falls over mid-song. The drumming duo swap places seamlessly, dance around the kit and throw sticks to each other right on the beat. The rest of the crew are similarly entertaining. The upright double bass player is dressed as an old-school priest, a 1920s flapper-girl plays the sousaphone and, stage left, there’s a washboard, tie rack and empty bottles to add to the band’s unique sound. The accordion player leads the audience in the sea shanty-style singalong Devil’s Child, and the fiddle-player shows a classical virtuosity in his violin solo, accompanied by screams and whoops from the audience. More stand-out solos include a talented trumpeter and an Irish Tin Whistle-player. No self-indulgent jazz nuts noodling away here, just some creative and simple moments of self-expression. Lead singer Paul-Ronney Angel’s gravel-voiced vocals are lurching and angry as he sings Hell-themed devil’s roots songs, but he also shows sensitivity in Goodnight My Dear, a eulogy to absent friends that ends the band’s first set. The song’s poignant brass and clarinet trio section quietens the audience so much that a loud-mouthed guy chatting at the bar is royally shush-ed by everyone nearby. Don’t ruin the moment, dude. A live band performance in a seated theatre setting like the Leicester Square Theatre is hard work with many of the audience are visibly frustrated. The rows of seats make it hard to dance, there’s no space to rock out, and a mosh pit is not an option here. Despite this, The Urban Voodoo Machine manage to pull it off: their theatricality and stage presence suit the venue and their huge commitment to putting on a real show. This band knows how to throw a party and, as they rock their way to the big finale, the audience are with them all the way. The Urban Voodoo Machine play the Glastonbury Festival this summer, and their third studio album Love, Drink & Death is released this September. Wondering how well their sound translates to CD? Watch this space for an exclusive review of the album. Meanwhile, there’s more bourbon-soaked debauchery at Paul-Ronney Angel’s regular night Gypsy Hotel.